​Those exposed to high levels of noise whether it is work related or leisure related should invest in high quality earmuffs that aim not only to protect the ears from piercing, damaging sounds but also to provide comfort. This is so that the wearer may don the muffs without problem for hours, especially if the exposure to noise is prolonged. ​What are the important aspects of the Champion Electronic Ear Muffs? ​What other things should you know about the Champion Electronic Ear Muffs? ​Muffs that have this quality aren’t that expensive and can be found in major hardware stores or in Amazon. You just have to find the right one for you and pick the perks that come with the muff if you wish too, such as a jack for MP3 players. Whatever you choose, your main goal is to find the most effective at blocking noise. With that in mind, check out Champion Electronic Ear Muffs, a very affordable electronic earmuff that don’t fall short on function while still being able to give maximum comfort. These muffs are electronic ones capable of shutting down completely whenever there are sound over 85 decibels. This is to protect your hearing against it so you’re far from going deaf. This is best used during hunting game wherein rifle noise is very loud while still functioning as your amplified ear when there are no gunshots. Electronic muffs come with microphones so that any other noise under the 85-decibel mark can be heard. These sounds are amplified so you don’t have to worry about the muffs blocking them. You can converse with ease as well as hear sounds like movement of animals that you’re tracking, and other environment sounds. As mentioned before, some users have complained about the sensitivity of the microphone that it picks up “white noise”, or those sounds that need not be heard such as wind and air movement, rustles, and many others. You can fix this by lowering the volume located on each side of the muff. These muffs come in a shell-cased ear protection that effectively covers each ear while still being comfortable. It has airflow technology so that your ears won’t perspire while encased in the hollows of each muff. The muffs are surrounded with comfortable foam, filled with water or gel not only for sound restriction but also for cooling purposes. The headbands are made of soft material and the metals are easily adjustable to fit the size of your head. These muffs have a noise reduction rating of 25 decibels. This NRR is sufficient enough as these muffs are electronic and can block away noise easily. You can use it not only for hunting or shooting but also for doing other chores around the house such as mowing lawn, cutting grass, repairing vehicles, or doing DIY projects. It is also important to note that some gunfire can go up to 160 decibels and that the reduced decibel may not be enough. You can consider getting extra protection such as having earplugs underneath. But as many reviewers have said about this product, this can efficiently protect and cover your ears even with continuous shots inside a firing range. The cups are made of high quality materials that it’s very sturdy and can effectively shun noise out. It houses a little bit of electronics inside for shutting down sound and for amplifying quiet noise. The cups are covered with high quality foam that doesn’t irritate the ears even after hours of wear. The headband is made of thick leatherette material lined with thick foam for added comfort. These headbands are supported with sturdy metal that can be easily adjusted according to your preferred height. Each of the cups comes with microphones for capturing and amplifying sound so you can easily converse with your family and friends while doing chores or participating in sporting activities. It has dials on each side for the volume so you can adjust the sound per side. For instance, you want to hear nothing on your left ear, you can simply adjust the dial accordingly. It fits all sizes of heads without problem through its easily adjustable headband. For the really affordable price, you’re getting high quality earmuffs that you can use not only inside the shooting range but also in your home while doing a number of noisy chores. It requires four AAA batteries (two on each side) that last a lot of uses. It also immediately shuts off before loud noise breaks and gets into your ear, which is really helpful as some electronic earmuffs are slow and doesn’t react as fast. It effectively shuts down very loud noise and amplifies soft sounds so you can hear them better. 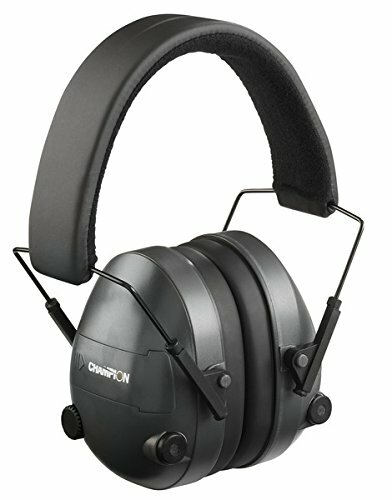 If you are a newbie at shooting or would just want to get something to protect ears for work-related purposes, the Champion Electronic earmuffs is the best product to start. Also check our article on the "​​What are the best Shooting Ear Protections? ", for more ​shooting ear protection choices.